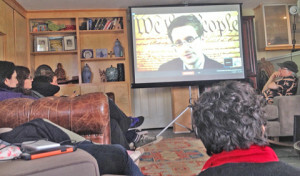 In a new report issued March 13, the Pew Research Center’s Internet and American Life Project has explored the motivations behind the relationships that American adults have with their public libraries. “Rather than describe the basic library usage of various groups, as we’ve done in the past,” Kathryn Zickuhr, the report, titled “From Distant Admirers to Library Lovers—and Beyond,” examines what traits go along with different levels of engagement with libraries and the library habits and views people have in common. The results are based on a nationally representative survey of 6,224 Americans ages 16 and older, Pew reveals, “a sample that is roughly three times larger than that of previous surveys in this research series. 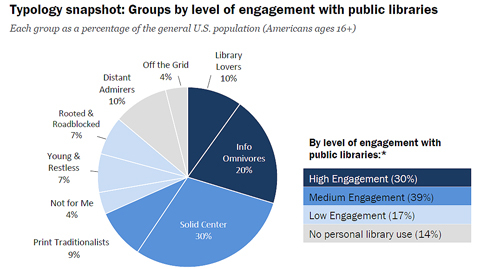 Public library users and proponents comprise a wide swath of America, with 30% being highly engaged with their public libraries and another 39% using their libraries regularly but to a lesser extent. Life stage and special circumstances play a major factor in library use. Students, parents of young children, job seekers, and those researching information to help them make a decision are more avid users; those experiencing more stability (job security) or “less momentous” times (retirement) might not use their libraries as often. Surprisingly, technology mavens do not eschew library use. Rather, more tech-savvy people are the library lovers who most frequently use public library resources. Information omnivores, who tend to have more education and higher incomes than library lovers, don’t use libraries much if at all, but still view them as an essential public service.